People in the south have been using the same okra recipes for generations. 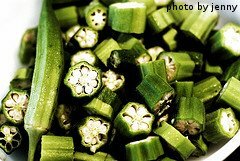 Okra can be boiled, roasted, grilled, sauteed, stewed, pickled and fried. It is also commonly used in soups, stews and gumbos. Okra also tastes great raw - it has plenty of crunch! We love several different recipes that feature okra. Before we share some of our favorites, here is some nutrient information. Place egg and milk into a bowl and whisk to combine. Add okra and let soak about 10 minutes. Meanwhile, in a medium bowl, combine cornmeal, flour, salt, black pepper, garlic powder and cayenne pepper. Remove okra pieces from the egg mixture and dredge in cornmeal mixture until coated evenly. Place okra in hot oil and let fry for 1 minute. Reduce heat to medium and begin gently moving okra around the skillet so it doesn't burn. Fry until golden brown on all sides. Remove from skillet to paper towels. Sprinkle with salt as desired and let drain. Serve hot, shortly thereafter. Place okra in a bowl. Drizzle with olive oil and toss to coat. Pile onto a baking sheet and sprinkle with salt, pepper and garlic powder. Bake in preheated oven for 12-15 minutes, or until just tender. Serve immediately. Place the chicken in a large pot and cover with water and sprinkle with salt. Bring to a simmer on the stove and let cook for about an hour. When chicken is fully cooked, remove it from the broth and let cool. Reserve the broth for later use. Pick the meat from the bones and set aside. While chicken is cooking, make the roux. Melt the butter in a large pot over medium heat. Reduce heat to medium low. Whisk the flour into the butter and stir every few seconds to keep from burning. Cook until roux is a dark brown color, about 25 minutes, stirring very often to keep it from burning. When the roux is the right color, remove from the heat and stir for another 2 minutes. In a skillet, melt butter over medium heat. Add onion, bell pepper, celery, carrot and jalapeno peppers. Sprinkle vegetables with salt. Saute until vegetables are soft, about 20 minutes. Pile vegetable mixture into the pot with the roux. Add the reserved chicken broth and place on high heat. Whisk vigorously to combine roux with the broth. When the mixture boils, the sauce will thicken. After it starts to thicken, reduce heat to medium and stir in cayenne pepper, Old Bay seasoning, paprika, chili powder, thyme, oregano and tomatoes. Cover and let simmer for about 30 minutes. Then use a submersible hand blender to puree the gumbo, eliminating the vegetable chunks and making it thicker and smoother. While gumbo is simmering, brown Andouille sausage in a skillet. Add the sausage, chicken meat and okra to the gumbo and stir to combine. Simmer uncovered for another 30 minutes or so. Place 6 okra pods in each of 3 sterile, 1 pint jars. Place one chili pepper and 1 garlic clove in each jar. In a saucepan, combine water, vinegar, salt and sugar and bring to a rolling boil. Pour liquid over ingredients in the the jars. Attach the sterile lids and rings and process in a hot water bath for 10 minutes. Store jars in a cool, dark spot for at least 4 weeks. Refrigerate after opening. Preheat outdoor grill for high heat. Lightly oil the grill grate. Place washed okra in a bowl. Drizzle melted butter over okra and toss to coat. Place okra on grill and sprinkle with Cajun seasoning. Grill about 4 minutes or until charred, turning frequently. Serve immediately. Brown the sausage in the bottom of a large pot over medium-high heat. Remove and set aside. Reduce heat to medium and melt the butter in the same pot. Add onion, celery, bell pepper, jalapeno pepper, carrot, garlic, apple and chicken. Sprinkle salt over the chicken and vegetables. Saute until chicken is cooked and vegetables are tender, about 10 minutes. Add the browned sausage, tomatoes, okra, chicken broth, rice, hot sauce, thyme, oregano, cayenne pepper and paprika. Stir well to combine and bring to a boil. Cover and reduce heat to low and simmer for 20 minutes or until rice is cooked. Add raw shrimp to the jambalaya and stir. Cover the pot and cook over low heat about 10 minutes, or until the shrimp are pink. Serve immediately. We hope you enjoy these okra recipes as much as our family does.